THIS DOES NOT INCLUDE THE HAMMER OR CHISEL PRICING! NOT INTENDED FOR WOOD REMOVAL, BUT IF THEY TRY,THEY NEED TO SAW CUT THE WOOD INTO SMALL RECTANGULAR PIECES AND USE A NARROW, 1" CHISEL. * Please call us for any questions on our chipper floor cer. 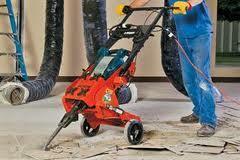 tile add hammer rentals in Santa Ana and Orange CA.